The excellence of Dolphin Cove shines through when you note that this organisation has held this very title since 2011 and doesn’t seem like it will let go of it any time soon. Dolphin Cove is a part of the Dolphin Discovery Group, which is the largest dolphin company in the world and offers an unparalleled opportunity to swim, pet and play with dolphins! Tick this one off your bucket list on your next vacation, you can take advantage of their ‘Book early and save’ promotion, offering 40% off their Swim with Dolphins Program! The Sangster International Airport (MBJ) has held this title for almost a decade now, since 2009 as the Leading Airport in the Caribbean. Sangster International Airport is ideally located on the northwest coast of the island – at the centre of the country’s main tourism region and close to a wide range of hotel and resort facilities. The airport is within easy driving distance of the cruise ports at Montego Bay and Ocho Rios as well as the popular tourist town of Negril. Their warm and courteous staff gives the perfect start of your vacation in the Home of All Right. 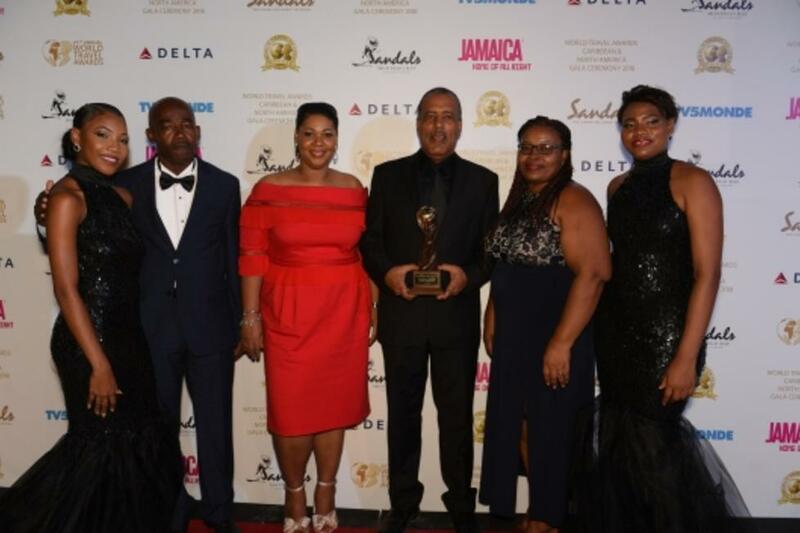 Club Mobay at Sangster International Airport stays true to the tradition of excellence upon which it is founded, and has a track record of being the leading airport lounge in the Caribbean for 5 years now (since 2013). Their attention to every detail, intuitive programmes and service with a smile are just a few reasons why it is simply the best! Make your next flight to our island and back be as relaxing as your stay here (if not more) and utilize their world-class services! This quaint and charming hotel set in the most pristine area of Jamaica, Port Antonio has copped numerous nominations in the likes of Caribbean’s leading luxury Hotel Villa as well as the World’s Leading Boutique Hotel. The Hotel is surrounded by the wonder that is Port Antonio which effortlessly combines Jamaican roots with a modern Caribbean lifestyle, all nestled in a relaxed coastal setting. Come and see for yourself why this area has been dubbed the ‘Jamaican Rivera’ and why the Trident hotel adds so much more with its excellence. The GoldenEye Hotel and resort and Fleming Villa both saw streams of celebrities and even royalty on its grounds from inception till now. The birthplace of legendary tales turned movies, and home to the creator of the iconic 13-part James Bond novels, Ian Fleming. The rich history to be explored and relived together with the luxurious amenities and services provided by the Hotel and Resort; and the endless activities of swimming, snorkelling and even paddle boarding will leave no doubt in your mind why they won these coveted titles. Take advantage of their package deals: ‘Four nights for the price of Three’, ‘Seven Nights for the price of five’, grab more deals here. You can find out more about the birthplace of James Bond here. Half Moon has held the title of being the Caribbean’s Leading conference Hotel since 2012, and honestly we can see why. Elegantly set amidst 400 tropical acres in magical Montego Bay and just 10 minutes from Sangster International Airport is a place where family, couples and groups always meet with success: The Half Moon Resort. The resort provides the most upscale amenities with understated elegance. It also includes championship Half Moon Golf Club, more than 26,000 square feet of meeting and convention facilities, the Anancy Children’s Village, Fern Tree Spa, the Equestrian Centre, Dolphin Lagoon, all in one of the most complete locations you can imagine. Apart from their accommodating conference spaces, they also offer an exclusive Yoga Retreat with the famous Robin Martin. Check out all their deals here!